The “Blowback Effect” – Why Do Foreign Fighters Return? Why do Foreign Fighters from the Islamic State return home and what are the perspectives for European security? With the slow decline of the Islamic State in Syria and Iraq, European governments are worried about what will happen if foreign fighters start returning home. It is still difficult to understand why people leave to join the fighting while, simultaneously, little is known about why they decide to leave the warzone and come home. Do they return to escape the brutality of IS or to put their experience into practice and carry out attacks? Is gaining military experience in a warzone really necessary to carry out terrorist attacks at home? Sweden, Austria and the Netherlands each, have also witnessed between 200-300 of their citizens leaving to join terrorist groups abroad. With numbers this significant, the question is what happens if they come back? According to most recent report by The Radicalisation Awareness Network (RAN), approximately 20-30% of European foreign fighters have returned, with rates greatly differing between countries, up to half in some. These numbers are 50% for the United Kingdom, 46% for Denmark and 33% for Germany, but only 21% for Belgium, 18% for the Netherlands and 14% for France, based on estimates by The Soufan Group. 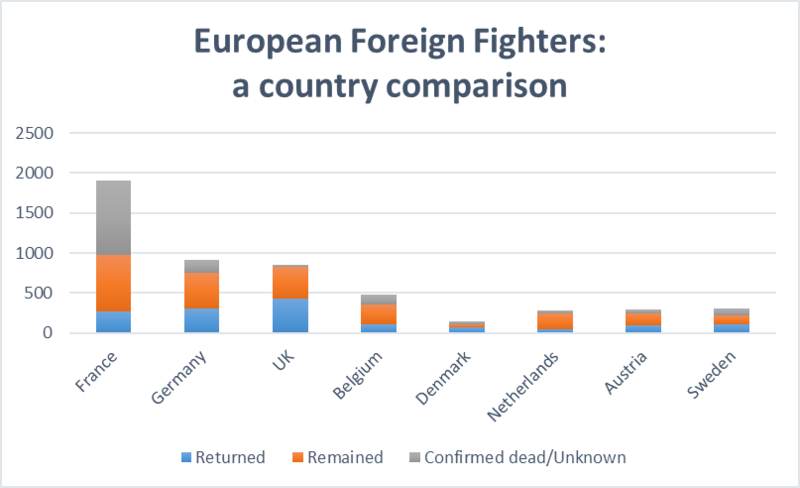 This basically means that around 425 foreign fighters have returned to the United Kingdom, approximately 300 to Germany, 270 to France and around 100 to Austria, Belgium and Sweden each. 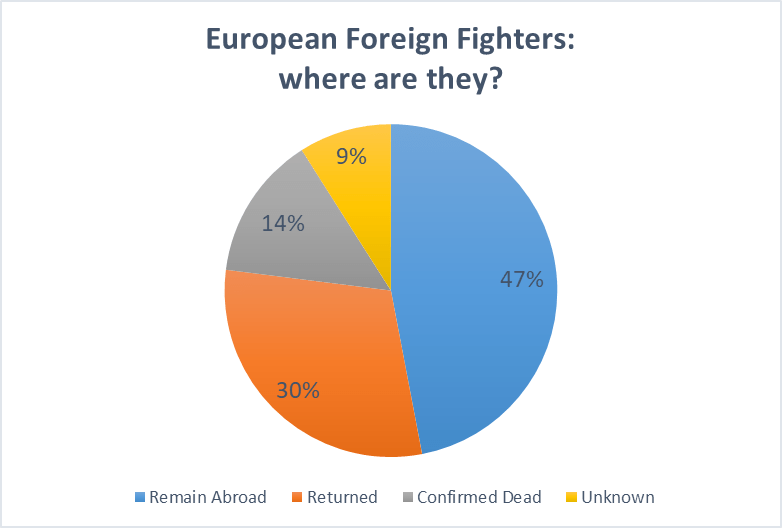 According to a another study from the ICCT, the last few months of 2016 have witnessed a drop in the flow of foreign fighters emigrating and an increase in the number of those returning to Europe. this tendency can be attributed to a number of factors. Firstly, since the declaration of the Caliphate in 2014, the Islamic State (IS) has been continuously losing territory. Between the second half of 2014 and mid-2017, IS lost 60% of its territory in Iraq and Syria, including access to and control over many oil fields. Due to shrinking oil revenues (an 80% loss in the above mentioned timeframe), it is becoming increasingly difficult for the group to maintain its financial infrastructure and pay its fighters. Secondly, the loss in territory also questions the appeal and capability of IS to be the group it promises to be: the creator of the Islamic Caliphate. Peter Neumann of the International Center for the Study of Radicalization at King’s College London also stresses that the appeal of IS rested on its strength and success; now that it is losing, it is not as attractive as it used to be. This, in turn, has led to a “self-reinforcing spiral of decline”, and with the decreasing flow of fighters, the group is less capable of fulfilling its self-proclaimed prophecy of establishing the Caliphate. Thirdly, as Neumann points out, it has become increasingly difficult to travel to IS-held territory due to multilateral efforts undertaken by key countries. Tanks are now lined up at 50-yard intervals on the Turkish-Syrian border, the main crossing point for European foreign fighters. European and Turkish intelligence along with law enforcement agencies have stepped up intelligence sharing efforts, making travelling to Syria via well-established routes more difficult. At the same time, North African countries have also introduced measures to stem the flow of their own fighters, preventing the creation of alternative routes for Europeans heading to Syria. In Tunisia, all men under 35 who seek to travel outside of the country must obtain a written permission from their parents stating their purpose for leaving. Meanwhile, Egyptian authorities have started paying off tribes along the Libyan border that run human-smuggling networks to block the path of foreign fighters. These measures do not only stem the flow of fighters to the Middle East, but also helps stop those who are fleeing the crumbling Islamic State and want to return home. Domestic terrorists in the making? Disillusionment or disappointment: those who leave in search of adventure, in hopes of creating a “better world”, an Islamic Caliphate, or to fight against the oppression of fellow Muslims under the Assad regime might find themselves disillusioned once they are confronted with the harsh reality of life in a war zone: the cruelty and corruption displayed by IS, the extreme misinterpretation of Islam, or the persecution of fellow Muslims. They might also find themselves performing mundane tasks for the organization instead of taking part in fighting, while women lured into the Islamic State with the hopes of romance and adventure might end up being abused. Mental health issues: these might either be due to pre-existing social and psychological problems, or acquired while taking part in terrorist activities abroad, such as post-traumatic stress disorder (PTSD). Also, there is the possibility of developing a so-called “moral injury”. According to Lesse Lindekilde et al.’s 2016 article ‘Who Goes, Why, and With What Effects: The Problem of Foreign Fighters from Europe’, moral injury is “a personality disorder, caused by having witnessed or having been forced to engage in cruelties or inhumane actions one would not have thought possible, resulting in loss of faith in one’s own and one’s fellow human’s ability to act as moral beings”. Further radicalization: fueled by their experiences abroad, those who return to their home countries may carry out terrorist attacks or recruit others to join the group. While all the above motivations are a cause for concern, foreign fighters falling under the last category are considered the biggest threat to the security of their home countries. The question is: how many of those who return from fighting in war zones actually radicalize further and carry out attacks at home and is it worth for them to leave in the first place? Thomas Hegghammer’s 2013 article, ‘Should I Stay or Should I Go? Explaining Variation on Western Jihadists’ Choice between Domestic and Foreign Fighting’ suggests that Western jihadists prefer to fight outside the West and that most foreign fighters “do not come home to roost”. Why is foreign fighting more appealing to these radical individuals than carrying out attacks domestically? According to Hegghammer’s research conducted on jihadists from North America, Western Europe and Australia between 1990 and 2010, there are multiple reasons. Firstly, as we can see from recent terrorist attacks in Europe, most perpetrators only get one chance before being killed or arrested. Assuming that foreign fighters want to take part in fighting for as much time as possible, it would be worth travelling to Syria, where they can fight longer. Even though the risks associated with travelling to and staying in a war zone are extremely high, once arriving, opportunities to engage in armed struggle are more numerous than back home. Secondly, as Hegghammer points out, a common misconception is that foreign fighters are domestic attackers in the making who seek to travel abroad to receive military training and acquire specific skills in order to carry out attacks upon return. But does someone require military training or specific skills for an attack? Again, looking at recent attacks, it does not seem so. Acquiring and using a hand gun, hijacking a truck and driving it into a crowd or attacking civilians with a knife are not skills one would necessarily need training for. Based on foreign fighter testimonies, the majority only go through basic paramilitary training, which in itself is not necessary to carry out domestic attacks, and only a handful of them receive specialized training such as bomb making or counter-surveillance. However, those who do return home with the intention of carrying out a terrorist attack tend to be more effective in doing so, as it will be discussed later. Thirdly, according to Muslim law and norms, foreign fighting is more legitimate than domestic fighting. Hegghammer argues that, generally, the more conventional a military technology, the more legitimate it is considered by Islamic law. There has been general disagreement among Islamic clerics regarding terrorist acts, with special regards to targeting civilians. However, even the most radical clerics debate their legitimacy and have voiced reservations against carrying out terrorist attacks in the West. Therefore it can be concluded that, generally, most Islamic clerics condemn “out-of-theatre attacks on noncombatants”. Again, it is important to note, that firstly, extremist groups such as IS follow and preach a distorted interpretation of Islam, and have repeatedly dismissed mainstream Islamic scholars. Secondly, as it has been seen, most foreign fighters have a superficial knowledge of the teachings of Islam. Therefore, it is highly questionable whether those Europeans who plan to become foreign fighters are dissuaded by the teachings of mainstream Islamic clerics and whether they take these religions teachings into consideration when they decide to travel abroad in order to engage in combat. Wanting to be part of something bigger than themselves, such as the creation of an Islamic Caliphate, is a key motivation for those leaving to join the ranks of IS. The high proportion of women amongst foreign fighters along with the important role they play in IS propaganda and recruitment clearly underlines this motivation. Women are crucial for IS for two reasons: firstly, to attract even more women, and secondly, to repopulate the Caliphate and raise a new generation of IS fighters. Therefore, from the point of view of IS, it would be counterproductive to let these fighters return home. As for the foreign fighters themselves, returning home to carry out attacks would not fall in line with their initial motivation : taking part in establishing the Caliphate. out of all executed attacks with fatalities, this ratio was 67% (8 out of 12 plots). This means, that 29% of plots involving veterans reached execution and 16% caused fatalities, while for those without veterans, these numbers are 18% and 7% respectively. If we look at recent attacks in Western European cities, the figures show a somewhat diverse picture. Both of the perpetrators of the January 2015 Charlie Hebdo attack received training in Al Qaeda’s Yemen camps. Moreover, five out of the 15 people involved in the November 2015 Paris attack are believed to have previously been to Syria. In Belgium, the shooter at the Brussels Jewish Museum in November 2014 had also previously spent a year fighting in Syria. As did one of the three men involved in the March 2016 Brussels airport and metro station attack, while the other two attempted to travel, but were stopped by Turkish authorities. The 2012 Toulouse shooter also spent some time in Pakistan and Afghanistan prior to returning to France. However, neither the January 2015 Paris kosher supermarket attacker nor the Nice Bastille Day attacker spent time abroad training or fighting. To look at the terrorist attacks that shook Europe this past year, a trend seems to be even more evident. Except for the May Manchester attacker, who previously fought for armed Islamist groups in Libya, none of the perpetrators of the 2016 December Berlin Christmas market attack, the March 2017 London attack, the April Stockholm attack, the June London Bridge attack (although one of the men tried to travel abroad, but was stopped at the airport), or the August Barcelona attack went abroad to fight. It seems like foreign fighting is no longer a necessary prerequisite to carry out deadly attacks in Europe. It is important to note that the other eight out of nine foreign fighters returning to Europe flee the brutality of the Islamic State and the consequences of their decisions. To put this in numbers, it means approximately 378 returnees for the United Kingdom, 241 for France, 267 for Germany and 91 for Belgium have no intentions of carrying out violent attacks. However, having witnessed or suffered trauma, left unaddressed, these individuals could potentially further radicalize and commit violence in the worst case scenario. Their inability to return to normal life is certain and their future actions will greatly depend on what kind of environment awaits them upon return.